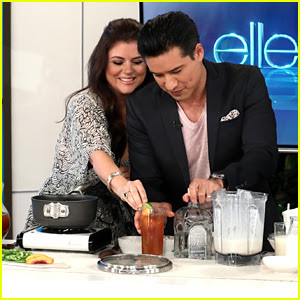 Mario Lopez and Tiffani Thiessen, both 44, had a Saved by the Bell reunion during a new episode of the Ellen DeGeneres Show. “Oh my God, I can’t believe I’m that old. I thought it was 20 years but it’s been 30 years since Saved by the Bell!” Lopez tells his former costar. “We are old, we are really old,” Thiessen agrees. Since Saved by the Bell premiered on August 20, 1989, both Lopez and Thiessen have become parents to kids who have now become familiar with the characters that launched their careers. “Harper started watching it a tiny, tiny bit. I was okay with season one but after that kissing started happening and I was like, ‘No, no, no we’re done,’ ” Thiessen says, adding that it’ll be a “few more years” until her daughter will be able to watch more episodes. “She’s 8,” adds the actress, who is also mom to 3-year-old son Holt. Meanwhile, Lopez’s kids, Dominic and Gia, may not be fans just yet. This was the first time Lopez and Thiessen had a mini Bayside High reunion. In August 2017, the duo got together with their family members at a charity event in Los Angeles. “I have the Bayside High jacket. It’s packed in a nice place so the kids might want to pop it out one day!” Thiessen told PEOPLE at the time.